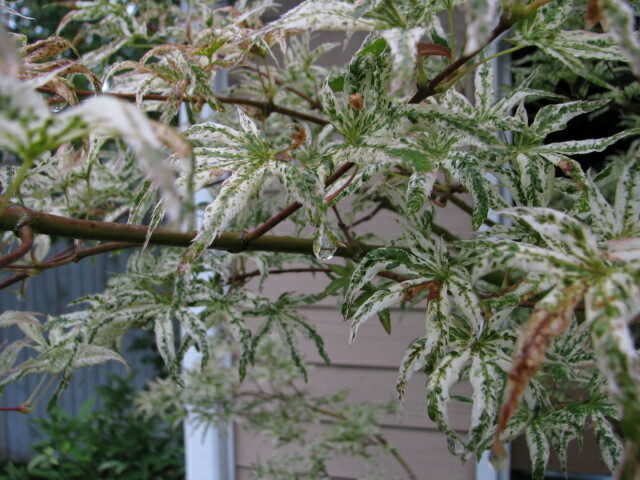 Sometimes Japanese Maples need protection from the sun. My Ukigumo of three years was exposed to the West facing hot afternoon sun. It tried valiantly this summer to ignore that bright celestial sphere. June and July were a breeze. August came around and with hotter temperatures and desiccation the leaves began to show signs of scalding. Brown patches appeared. Fortunately damage was minimal and no leaves were lost, but this tree should be moved next summer. Some plants want it all, not Ukigumo. Partial sun please, and more water when planted in a container. Yes, I’ll do whatever it asks, because this tree entrances and enhances, but don’t take chances. Ukigumo–part shade.